View More In Dining & Entertaining. 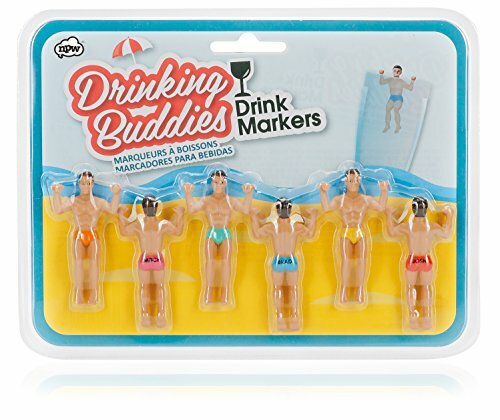 6 Speedo-clad muscle men drink markers to mark your drink and avoid mix ups. Hang a hunk on the side of your glass! Everyone needs a drinking buddy, especially one who looks great in a pair of budgie smugglers! Essential for bachelorette parties, girls' nights, picnics or anytime the drinks are flowing. It's always time to have a laugh with NPW whether it be a birthday, office prank, sleepover, party or just because you want a mega LOL. NPW lives and breathes cheekiness. Entertain friends with hilarious gifts and gadgets that will crack them up! There is never a dull moment with NPW in your life!. If you have any questions about this product by NPW-USA, contact us by completing and submitting the form below. If you are looking for a specif part number, please include it with your message.